From left, Shirley Ong, M.D. ; Orwa Aboud, M.D., Ph.D.; Carlos Romo, M.D. ; and Kinshuk Sahaya, M.D., celebrate the achievements of neurology residents Aboud and Romo, who were both selected for a prestigious neuro-oncology fellowship with the Johns Hopkins University School of Medicine and the National Institutes of Health Neuro-Oncology Branch. Ong is their adviser and Sahaya is the neurology residency director. June 13, 2017 | June 13, 2017 | Two residents from the University of Arkansas for Medical Sciences (UAMS) have been selected for a prestigious fellowship in neuro-oncology administered jointly by the Johns Hopkins University School of Medicine and the National Institutes of Health Neuro-Oncology Branch. A maximum of two fellows per year are selected for the program, and this year, both are from UAMS. 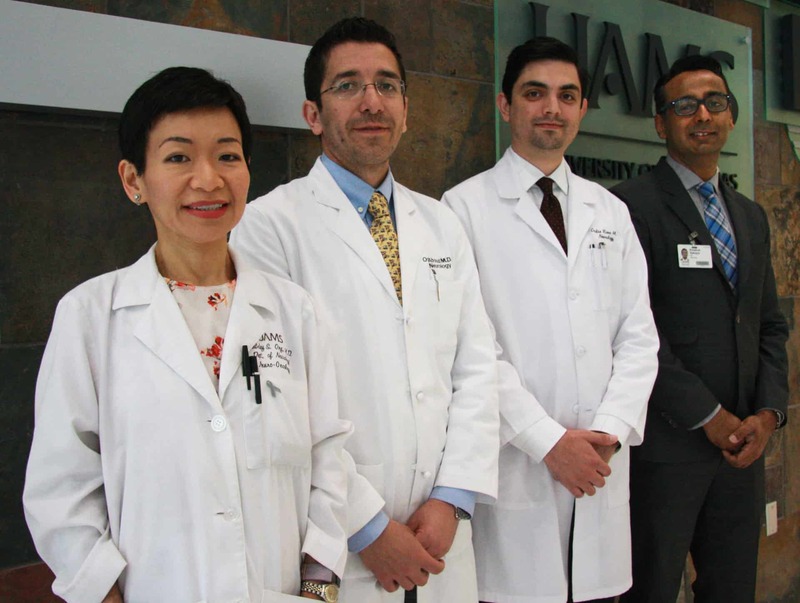 Carlos Romo, M.D., co-chief resident physician; and Orwa Aboud, M.D., Ph.D., will complete their residencies in the Department of Neurology in the UAMS College of Medicine in June and begin their fellowships in July. 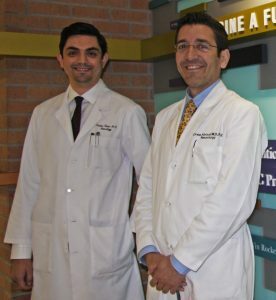 Carlos Romo, M.D., co-chief resident physician, left; and Orwa Aboud, M.D., Ph.D., will complete their residencies in the Department of Neurology in the UAMS College of Medicine in June and begin their fellowships with Johns Hopkins/NIH in July. The fellowship provides advanced training for neurosurgeons, radiation therapists, medical and pediatric oncologists and neurologists to prepare them for academic careers in neuro-oncology. The experience is tailored individually to the needs of the fellow. Both Romo and Aboud will spend three years expanding both their research and clinical experience through courses, research projects, mentoring and clinical rotations. Ong, M.D., said that both have unique skillsets to offer their patients and expand the future of neuro-oncology. Romo is from Aguascalientes, Mexico, and earned his medical degree at Tec de Monterrey in Monterrey, Mexico. Sahaya, M.D., described him as a dynamic and multifaceted resident whose teaching ability is appreciated by students and faculty alike. For example, Romo helped Sahaya redesign part of the neurology residency curriculum. Ong described him as a leader who sets goals and accomplishes them. Romo said his time at UAMS exposed him to a wide variety of patients, especially because of UAMS’ partnerships with Arkansas Children’s Hospital and the Central Arkansas Veterans Healthcare System. He is looking forward to expanding his experiences even further. Aboud is from Swaida, Syria. He attended medical school at the University of Damascus in Syria and graduate school at UAMS. Sahaya described him as an outstanding resident and researcher and a skilled physician. He is a great team leader who is loved by colleagues, faculty, students and patients alike. His research is already garnering him top honors. Ong said Aboud is extremely compassionate and goes above-and-beyond with his patients. Aboud said that early in his neurology residency, he took part in a neuro-oncology rotation that exposed him to how big the impact of basic and clinical research can be on patients’ treatment options and quality of life. He values the fact that both the UAMS residency and the NIH/Johns Hopkins fellowship give him both research and clinical exposure. The UAMS Neurology Residency is a four-year program open to students who already have a medical degree and are looking for advanced training in neurology. Residents can then move on to become practicing neurologists or pursue additional specialized training through fellowships, like Romo and Aboud. For more information, visit neurology.uams.edu.